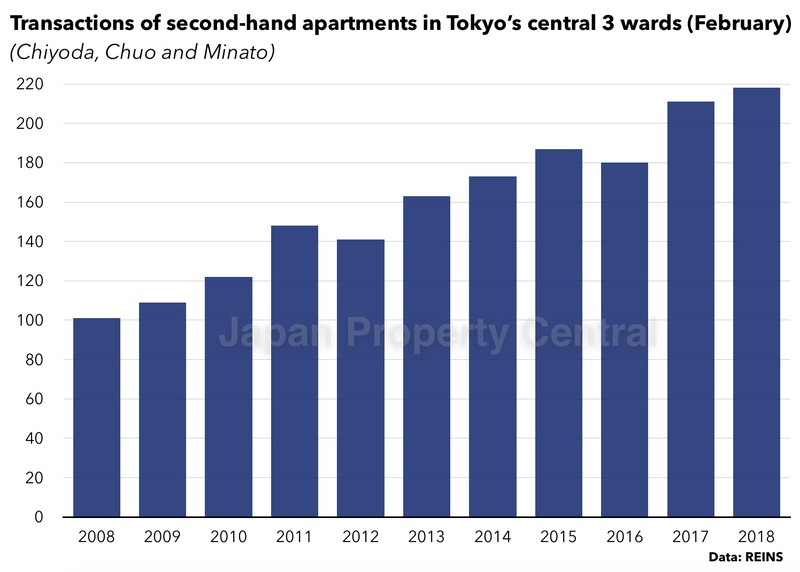 According to REINS, 3,424 second-hand apartments were reported to have sold across greater Tokyo in February, up 29.6% from the previous month but down 1.1% from last year. The average sale price was 33,530,000 Yen, down 0.2% from the previous month but up 6.4% from last year. The average price per square meter was 511,900 Yen, down 0.8% from the previous month but up 3.9% from last year. This is the 62nd month in a row to see a year-on-year increase in sale prices. 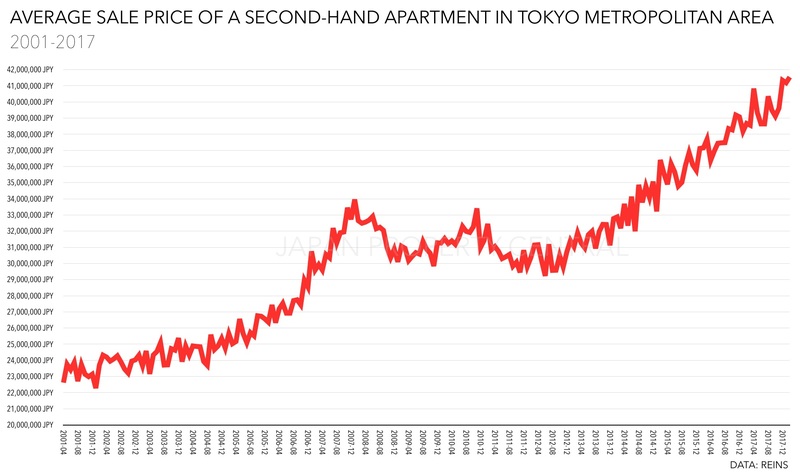 1,762 second-hand apartments were sold in the Tokyo metropolitan area, up 25.6% from the previous month but down 1.2% from last year. The average sale price was 41,540,000 Yen, up 0.9% from the previous month and up 7.4% from last year. This is the highest sale price seen since REINS began publishing data in 2001. 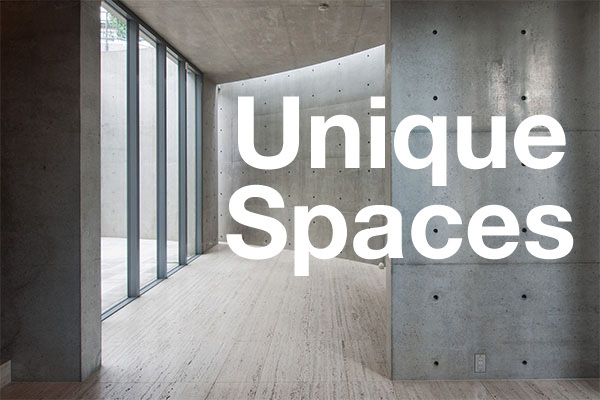 The average price per square meter was 677,100 Yen, down 0.5% from the previous month but up 4.0% from last year. This is the 65th month in a row to record a year-on-year increase in sale prices. 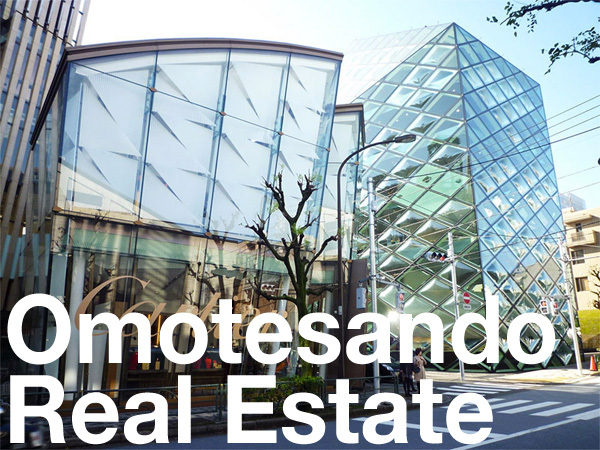 In central Tokyo’s 3 wards of Chiyoda, Chuo and Minato, the average sale price was 62,000,000 Yen, up 3.7% from the previous month and up 9.2% from last year. The average price per square meter was 1,083,300 Yen, down 0.4% from the previous month but up 6.9% from last year. This is the 11th month in a row to record a year-on-year increase in sale prices. 218 apartments were reported to have sold during the month, up 42.5% from the previous month and up 3.3% from last year. This is the highest volume seen for the month of February since record-keeping began in 2008 and is double the average volume seen between 2008 and 2010. New listings for the month increased for the first time in 16 months with a 0.1% increase from February 2017. Remaining inventory dropped for the 11th month in a row to 3,595 apartments, down 5.4% from last year. Source: REINS, March 12, 2018.